"Bangor Cigar Manufacturing Co. 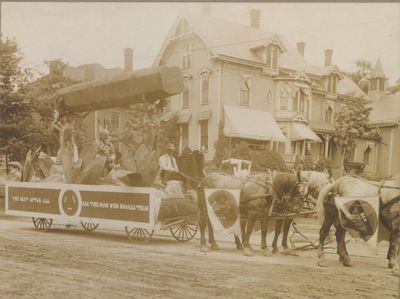 Parade Float June 18, 1912"
Several floats were awarded prizes. The Bangor Cigar Manufacturing Co. float won best team of two heavy horses in harness. Prize was $7.50. Bangor Cigar Manufacturing Co. was located at 26 State Street. George Rockwell Youngs served as company manager.